The AmD with Cobra Exhausts team will seek to return to the points scoring positions when the Dunlop MSA British Touring Car Championship heads for Thruxton this weekend for the third round of the year. The West Thurrock-based team enjoyed a strong start to the campaign at Brands Hatch, with Ollie Jackson taking a maiden podium finish in the series, but then failed to score last time out at Donington Park – despite both Jackson and rookie team-mate Sam Smelt showing strong pace on track. Tamworth-based Ollie could – and arguably should – have added to his points tally during the second meeting of the year but was the victim of some robust driving from his on-track rivals over the course of race day. 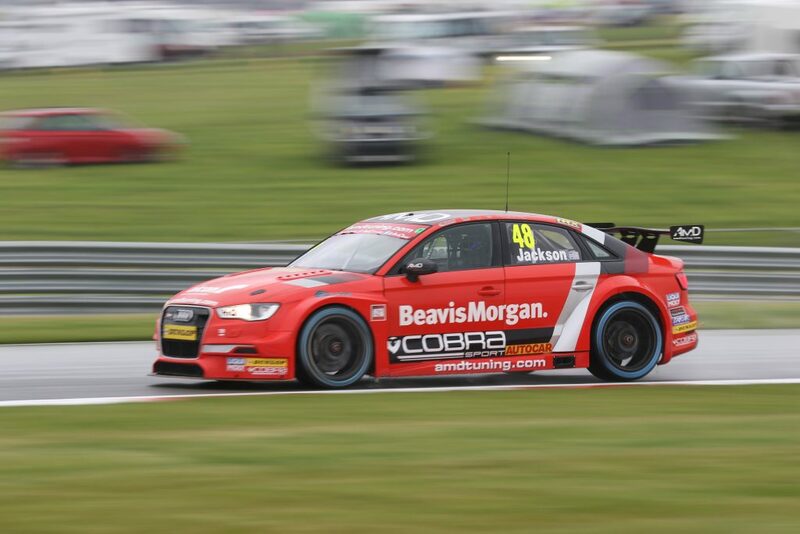 Despite that, the 34-year-old remains well placed in both the Independents’ Championship and the Jack Sears Trophy as he returns to the circuit where he picked up his first points finish in his Audi S3 back in 2016. Since then, extensive work from the team has transformed the car into a regular points-scoring contender, leaving Ollie in optimistic mood about his chances on track. Team-mate Sam will be making his race debut at the fastest circuit on the calendar, with his only previous experience of the Hampshire venue coming during official testing last month. A busy day on track allowed the Northampton racer to complete more than 50 laps as he worked to gain as much knowledge and experience of the circuit as possible. Fresh from a strong performance on track at Donington, where he broke into the top 20 in qualifying for the first time, Sam will seek to try and challenge towards the top 20 come race day and maintain the progress made in his short touring car career to date. “Thruxton hasn’t always been my favourite circuit on the calendar, but I’m looking forward to going there this weekend. Sam had a productive test last month that has given us a good base set-up to start with, and I’m keen to see how we get on. “So far this season we have shown good pace in the Audi, and it was only through bad luck that we didn’t add to the points we scored at Brands Hatch during the last round at Donington Park. “I’m really looking forward to Thruxton. The test we did last month was the first I’ve been there and the circuit was everything people told me it would be. It’s extremely fast and I’m excited about the prospect of racing there for the first time this weekend. “So far this this season, it’s been tough for me because of the changeable conditions that we faced at both Brands Hatch and Donington, so I’m looking forward to a weekend where the weather will be – touch wood – pretty good throughout. That will help me to maximise my time on track so I can push forwards and look to continue improving. “Both Ollie and Sam have done a good job during the first two rounds of the year and we head to Thruxton feeling optimistic about their chances. Although the podium at Brands Hatch was the obvious highlight, both drivers have impressed with the way they have driven so far this season and we’ll be hoping for more of the same this weekend.